Antje and her daughter Mia cook together. Everything in the kitchen is hidden, including the outlets that pop up from the island with the touch of a button. Jan and Mia rinse their feet in the repurposed surfboard shower. When Antje Heinz and her family decided to build their dream home, Antje set about it systematically. 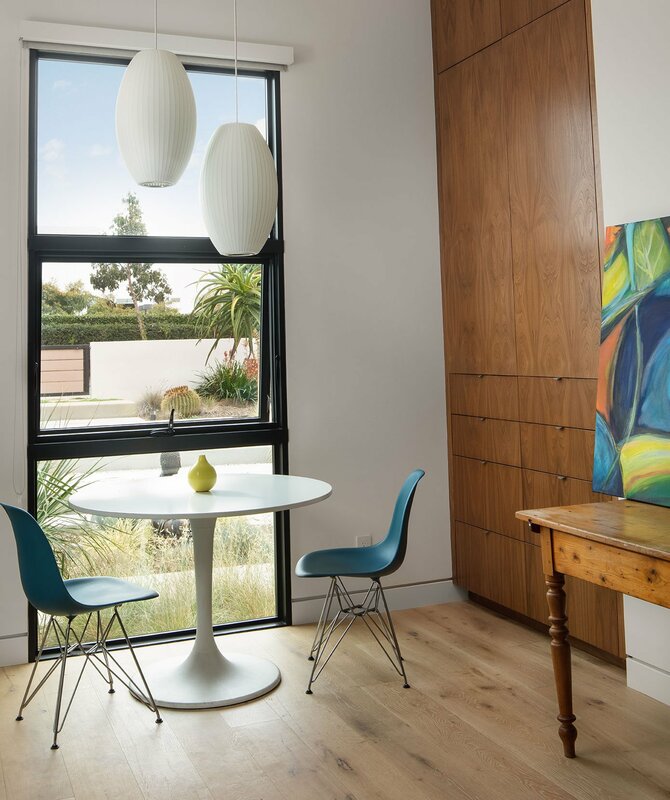 She assembled a compatible team who understood her German background to realize her vision of designing a comfortable, coastal, contemporary “green” house, integrating the best of southern California indoor-outdoor living with European aesthetics. Her search for the right house took about a year. While narrowing her hunt, she brought in Belgian-born Doro Pirino of Dorothée Claude Interior Design and French-born Jean-Louis Coquereau of JLC Architecture to advise her whether a structure was suitable for her sustainability goals and family’s needs. Choosing the property was a team effort, Antje explains. After they found the house, the trio met weekly to maintain the project’s momentum, completing the project in two years. Mia, a gymnast, practices her acrobatics just outside the living room. The location of the home appealed to Antje immediately. Set on a quiet street with easy access to the freeway, the residence (originally powder-blue) met her essential criteria: It was within walking and biking distance to the beach, shops and “old Encinitas,” enabling Antje’s family to replicate the active outdoor lifestyle she enjoyed in Germany. Best of all, it had an ocean view and “good bones,” making it easier to remodel, plus, her children’s friends lived close by. White and wood dominate the palette in the Heinz home, but Antje loves vibrant artwork and peppers it strategically throughout her home. Creating a sustainable design topped Antje’s requirements for her new home, fulfilling the dream she shared with her late husband, Udo, who died in a bicycle accident five years ago. Building their dream home, which Antje dubbed NEUHAUS (German for new house) marked a new beginning for her and children Mia, now 12, and Jan, now 15; their two cats, Pearl and Pirate; and Coco, the bunny. “We like green energy. We always knew we wanted to build a green house in the sun. When [Udo] passed, it was one of my creative goals to construct a green house,” Antje says. To build the home she and Udo envisioned—one with clean lines, that is efficient and lacks clutter—Jean-Louis recruited as general contractors Jeff Adams and Rich Williams of Alliance Green Builders (AGB), who specialize in certified-LEED (Leadership in Energy & Environmental Design), eco-friendly design and construction. For the Heinz home they achieved LEED Platinum certification. There’s a separate entrance to Antje’s home office, where she tutors students in German. In taking the house down to its studs, AGB deconstructed rather than demolished the house. “It was a little more expensive and took a little longer,” Rich explains, but they were able to reuse or recycle most of the old building materials, which were still in good condition. “Utilizing the existing structure is inherently more sustainable,” adds project manager Tyler Van Stright of JLC Architecture. Sustainability and simplicity were paramount in selecting materials. For the exterior of the house they chose white stucco and, for siding and decking, Resysta, an environmentally friendly cladding made of rice husks, salt and mineral oil, set off with black aluminum windows. The house is set back from the street, with an enclosed courtyard in front that makes it feel secluded and cozy. The siding and decking is sustainable Resysta cladding. “When we had the option of reducing the number of materials, we did,” Tyler says. They narrowed the main interior choices to tile (for wet locations), white oak flooring, glass and walnut with black or metal accents. They retained the house’s basic footprint with minor modifications, expanding the house to just over 3,000 square feet. The original 2,300-square-foot structure, built in 1980 with a 1993 master suite addition, came with a few limitations. “We couldn’t change the envelope or shape of the garage because it was encroaching on the front setback,” Jean-Louis explains. Instead they softened the garage’s impact by pushing out the front, creating a 144-square-foot office with side entrance for the students Antje tutors in German. 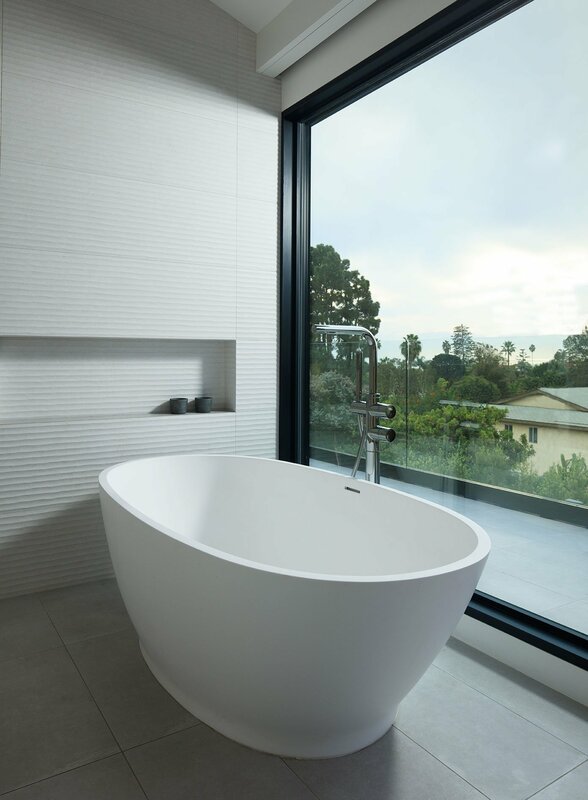 The soaking tub in the master bath capitalizes on the view. They also retained the upper level roofline because it exceeded existing height limits and expanded the second floor with a 534-square-foot addition, providing space for two children’s bedrooms and a bathroom, plus laundry room. Doro, an interior architect and designer, laid out the floor plan and devised the interior spaces, finishes and lighting design, adapting them to Antje’s needs and desires. “Antje was clear about what she wanted, in look and feel. She wanted a warm contemporary house, but not trendy, using timeless materials, timeless design, with efficient use of space,” Doro explains. 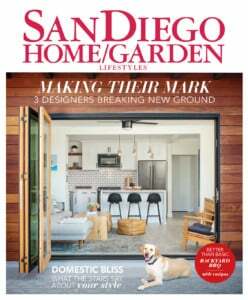 For indoor-outdoor living, they opened up the rooms and flipped the original home’s layout, creating an open-plan great room—with a cathedral ceiling, clerestory windows and clean lines—that combines living room, dining room and kitchen. Antje works from home, and though she has an office inside, she often prefers to work outside. The plan flows seamlessly onto an expansive deck through floor-to-ceiling retractable glass pocket doors, which Antje prefers to keep open (weather permitting) to encourage everyone to go outside. The children sit and read, play with friends in the pool or on the trampoline, or just practice gymnastics in the backyard. The kitchen, the heart of the home for Antje—who enjoys cooking with her daughter and baking traditional German breads and desserts—features an induction cooktop and steam oven, plus custom fold-up walnut cabinets with electronic touchpad closures. Prominently displayed on the otherwise-stark countertop is the espresso machine her husband, an engineer and cooking enthusiast, researched and selected. Antje hired an electrician to install 220-volt outlets in the kitchen to accommodate her small, German-import appliances. Antje pulls mugs from her custom fold-up cabinets with electronic touchpad closures. She collaborated with Tyler and Doro on designing the home’s, lighting—both natural and artificial—which was key. “We played a lot with light in designing the house,” Antje says. Before anything was built inside, Tyler showed her and Doro how the sun would move through the house throughout the year, using a three-dimensional design program. “The house gets great natural light during the day and glows beautifully at night with the use of artificial light,” she explains. In fact, it’s this dance that the light performs throughout the day that Antje now loves most about her home. Beyond light, Doro aimed to enhance the home’s colorful art. To do so, she started with a neutral palette, selecting whisper white paint, black or metal accents and European white-oak plank flooring with a subtle whitewash. For warmth, Antje knew she wanted to use walnut. 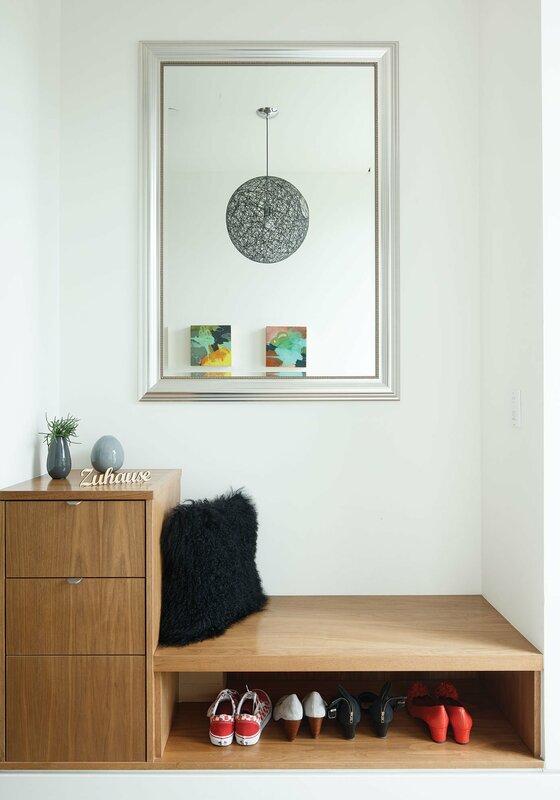 She worked with Doro and Tyler to design the home’s custom walnut cabinetry. 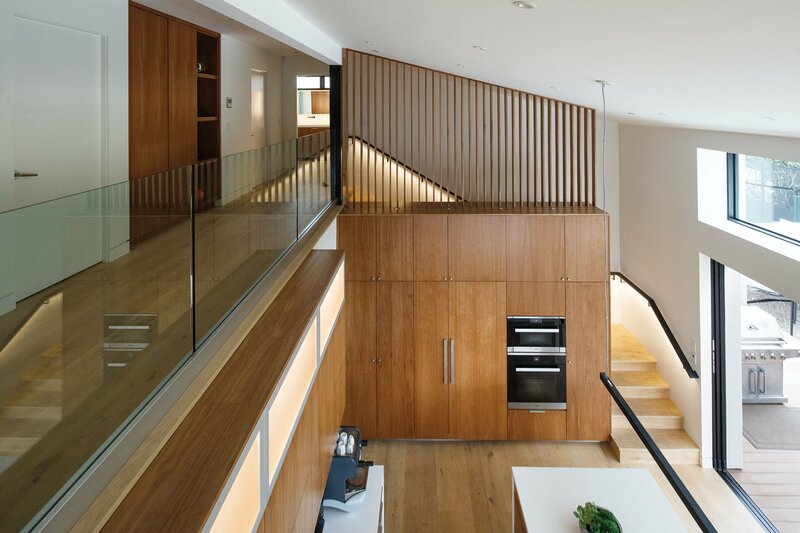 The home’s focal point, the slatted walnut screen Doro designed, separates the public and private spaces above the staircase. Minimalist but warm, the Heinz household is open and full of light. Udo, Antjes late husband, chose the coffeemaker that stays out on the countertop. “It serves not only as a guardrail but transforms the staircase into an interesting and inviting path where shadows and light bounce off the ceiling and walls and create a natural sculpture,” Doro explains. She fashioned a lighting design with layers of artificial light to create different moods. Lush bamboo stalks create a privacy screen in this bath just off Antje‘s home office. 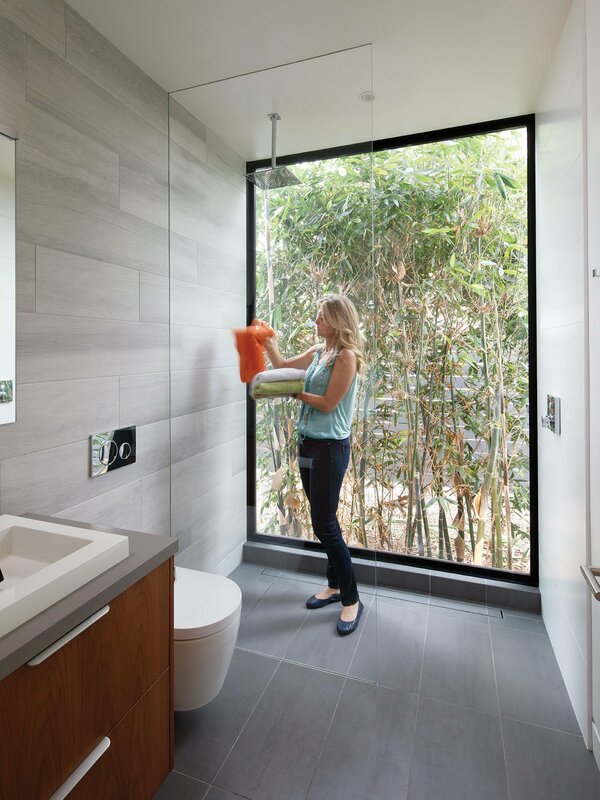 Another distinctive use of natural screening and light is the stand of fast-growing bamboo trees, enhanced by outdoor up-lighting, offering privacy for the downstairs powder room’s glass wall. “The outdoor lighting creates a painting and brings it to life,” Doro says. Green energy—using a solar/photovoltaic system with batteries storing electricity—and technology feature prominently in the home’s design. “One lesson we learned is to filter technology options to include only technology that is going to make a big improvement in the day-to-day living of occupants,” Rich explains. Antje confirms NEUHAUS is her green dream home come to life. “I love the light and feel of the house,” she says. “We feel very healthy and happy here—a new beginning.” We’re sure Udo would agree. Mia relaxes with Coco, the bunny, in the open-plan great room that flows seamlessly to the back deck.